It's been half a season for Clint Dempsey in the Premier League with Tottenham Hotspur and it is deja vu all over again. Early in the campaign, the recently-signed American scored a game-wining goal for the Spurs versus Manchester United to give the White Hart Lane team its first victory over United in 23 years. Today, on a snowy evening, he did it again. "Deuce" scored in the 93rd minute to give his team a 1-1 scoreline and prevent the Manchester club from obtaining another impressive win. It is now twice in one season that Manchester United has seen points erased by Mr. Dempsey and you can be sure this will not be forgiven or forgotten. That's a total of 5 points deducted from United this season courtesy of the American and he's showing no signs of stopping at 5 goals and 7 in all competitions. Little things like always scoring against the biggest teams tend to snowball into greater effects. Perhaps this is to be a trend for Dempsey? For now let's just say that the top English teams have categorized him as a major threat and Manchester United will look to double up on him from here on. Much has been said recently about the former New England Revolution and Fulham FC player: he's better than Landon Donovan, he's the best United States player, he chose his team well. While the Donovan argument is just that, an argument, he is undoubtedly the best American player in the world at the moment, and yes, Tottenham was the right destination for him. Aside from his exploits at the club level, Dempsey must now step into different shoes with the national team: he must be the one to carry the team into World Cup 2014, just as Donovan did for 2010. His partnership with Altidore must blossom in order to get the most out of what is potentially a high-scoring American attack. While Michael Bradley and Jermaine Jones have significant knowledge of the game, their position is more withdrawn and their attacking communication with Dempsey is thus limited. Due to this, and in the absence of Donovan, players like Mixx Diskerud, Joe Corona, Graham Zusi, Brek Shea and Danny Williams will need to step up their game if they are to deliver the passes to Dempsey. Once there was a club named Fulham FC of the Barclay's Premier League in England where many Americans got their first taste of European soccer, some to reach new heights (Clint Dempsey) and others to rethink their path (Eddie Johnson). It was clear to the team that American soccer players were a valuable asset and it helped them stay afloat in the always-competitive Premiership. Where Carlos Bocanegra and Brian McBride broke ground, Kasey Keller guarded the doors and suddenly other teams went looking for gold across the Atlantic. In came Tim Ream, Michael Bradley, Jermaine Jones and even Landon Donovan. All except for Ream left too soon, but their legacy remained. So when Stoke City agreed to terms with up-and-coming Geoff Cameron of MLS' Houston Dynamo, a new pathway open for American players. Cameron settled quickly, closed gaps and made Stoke a better team. Maurice Edu joined before the close of the transfer window but the defensive midfielder did not impress enough, possibly due to his diminished form after Glasgow Rangers folded (he is now on loan to Turkey's Bursaspor). 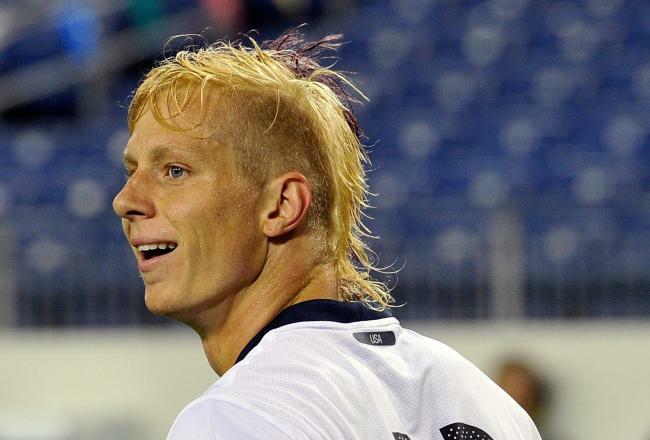 And yet, the Stoke City management decided to roll the dice on American talent one more time: Brek Shea. I was as surprised as many other fans, no doubt, that the FC Dallas winger could be on his way to the Premier League. He had a lackluster 2012, but so did Tim Ream in 2011 when he signed with Bolton during the January transfer window of 2012. He's a young lad at only 22 and if injuries are overcome and he is patient and disciplined, his skill and speed can become quite an asset. Two goals against Mexico during the USA's term with Klinsmann have been generated through his play and he was a go-to winger in the absence of Landon Donovan. Are we likely to see any more Americans make the jump to Stoke? Probably not, but the team's commitment to the developing game in the United States cannot be understated. This is why Dempsey joined (and thrives in) Tottenham, and it is why Michael Bradley now plays for Roma. Expect bigger things from our compatriots abroad. Stoke isn't the beginning, that goes to Fulham. Instead, the Trotters are an assertion that American soccer players have joined the elite and are here to stay.